Binh Ba village situated some two miles North of the Task Force Area and on the Western side just off Route 2 and comprised of around one thousand people in population - made up of mainly farmers and rubber plantation workers. The village houses was constructed of solid brick and tile. The village was well known to the Australians during the first tour and 5RAR stationed a rifle company and a mortar section within the village. This strategy proved to be a deterrent to the Viet Cong tax collectors and assassination squads taking control of the village. This however, was not to continue. In 1969 as the drain on the meagre resources of the Battalion proved to be too much and the village was left to the protection of Regional forces. On separate operations, 6RAR was engaged in a heavy contact with the enemy several miles north of the Task Force base. 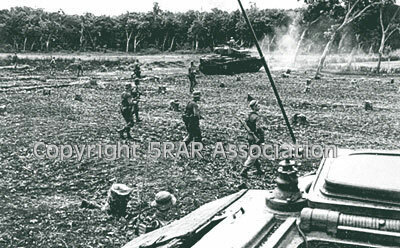 On the morning of 6 June 1969 at 0800hrs, a Centurion Tank and an armoured recovery vehicle moving through to assist 6RAR were fired upon from Binh Ba village. The initial intelligence report indicated that two (2) enemy platoons had infiltrated the village and the commander 1 ATF decided to react Delta Company to the village. The Ready Reaction Force (on 30 Minutes notice to move), consisted of D. Company 5RAR, a troop of tanks and an APC Troop (Armoured Personnel Carriers) were alerted to the incident and prepared to move to the area . The OC, D. Company issued orders and the force moved off to the village of Binh Ba. The company consisted of 3 platoons (10, 11, and 12 platoons) plus company HQ ( From this point on the account of the battle is described by the Platoon Commander of 10 Platoon). "On receiving the warning order, I mustered my men, in all, 15 plus myself, a medic and a radio operator. The usual platoon strength is 30 plus, so 10 platoon was less than half strength." "We pulled up just clear of the village. The open ground, cleared of trees some 300 yards from the village perimeter, gave a clear view. From my position, looking out from the open hatch of the APC, I could see a lot of people, 30 or 40 running, as if to take up defensive positions. The next moment, several RPG smoke trails were heading in our direction - all I wanted to do was to get out of the APC - one hit from an RPG would kill or wound all those aboard." With preparation from helicopter gunships, (9 Squadron RAAF) D. Company assaulted the village. The formation was extended line with 10 Platoon Right flank, 11 Platoon and 12 Platoon taking the centre and Left flank positions. Company HQ plus formed the reserve. The Centurion tanks were magnificent but they were no match against concealed enemy firing RPG 7's. Within an hour all three tanks were disabled due to damage and crew casualties. The Officer commanding D. Company decided to move his force out of the village and move to Western side of Binh Ba. With a fresh troop of tanks together with APC support, D. Company conducted a second assault on the village. Infantry platoons led the assault; each platoon had one tank and two APCs in close support. The CO, D. Company sent a radio message to the platoon commander 10 platoon. "You are not covering your objective, arrange your call sign to do so." "I swore at the company commander (under my breath) and decided to break my platoon up into house clearing teams. This meant 5 teams of two to three men. Platoon HQ would form another team of two, myself and one other. We still had the tank and two APCs but, control of the platoon and the support vehicles would now pose a problem." "The left clearing teams as well as the right clearing teams will move one row of houses forward and remain there. The centre clearing team, myself and the radio operator, will clear the single centre row. I will give the order to move forward and we will do it all over again. If you get into trouble remember we have a tank and two APCs at our rear, get word to me by runner if you need them, any questions?" "Cpl Bamblett and I reached Pte Teeling but he was dead, all we could do was to drag his body out of the line of fire. Once this was done, I made contact with my tank and tried to speak to the commander using the phone at the rear of the vehicle, it wasn't working. Climbing up to the hatch I made contact and directed the vehicle commander to fire one round of H.E. (High Explosive) into the building." The house exploded and the clearing team assaulted immediately. Six enemy dead were found in the ruins. This type of action was typical all along D. Company's assault line. It was made clear some time ago that the strength of the enemy force was far greater than two platoons. It was confirmed from captured documents that D. Company was facing elements of the 1st Battalion, 33 NVA Regiment. Enemy weapons littered the battle ground. Some members of 10 platoon used discarded AK47's to conserve their own ammunition. The best laid plans of mice and men rang true in this case. 10 platoon groups were held up by enemy action. For example the platoon commander of 10 platoon confronted two enemy soldiers in one house - his centre clearing task. A brisk exchange of fire resulted in two enemy dead but, he also lost control of the platoon for about 15 minutes while this was going on. The other clearing teams also confronted enemy firing rockets and machinegun fire. 10 platoon teams were getting in front of the other advancing platoons (11 and 12 Platoons) . The platoon commander added: "It took me 20 minutes to regain control of the platoon and the lesson here is to lead, not to get involved in a fire fight." On one occasion the left hand groups of 10 platoon were mistaken for the enemy and attracted fire from one of our APCs. To say that the battle, which lasted for two days, was fierce and confusing is an understatement. Elements of the 1st Battalion 33 NVA took up defensive positions within the village and fought to the death. Other groups discarded their uniforms and weapons and mingled with the pockets of civilians unable to escape the fighting. This added another dimension to the conduct of the battle, and the soldiers of D. Company 5RAR exposed themselves to extreme danger trying to usher these groups to the rear of the battle zone. Other enemy groups tried to flee the village, or hide in the small air raid bunkers attached to every house. In one case, an enemy force as large as an infantry company attempted to enter the village to take part in the battle. In the latter case these forces were met by B. Company, blocking the exit and entry routes outside Binh Ba. To fully clear the village, every bunker, house and any likely areas of concealment had to be searched. In many cases face to face confrontations with the enemy took place as this procedure was being carried out. On the second day, the clearing of the village continued. D. Company, with a platoon from B. 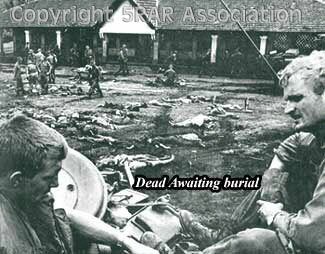 Company did much the same as on day one although, contact with the enemy focused on small groups of NVA still holed up in the village. 10 Platoon came across a women outside her house, she was in a terrible state, crying and gesturing to a partly collapsed bunker. A brief search by members of 10 platoon resulted in a young male around 15 years of age, being pulled from the hole. He was in a state of shock but no signs of physical injury. Still crying, the women refused to leave and kept pointing to the bunker. Further searching discovered the body of a young girl; she had been blown in half. We could do little to help the mother apart from wrapping up the body of her dead daughter and assist her and her son to reach a safe area to the rear. G. Johnson wrote "I have seen a sight under heaven that only God understands." B. Company - Engaged enemy forces in a blocking task around Binh Ba. Reacted to Duc Trung against a large enemy force. Assisted D. Company with a platoon attached on day 2. Assault Pioneer Platoon - Reacted to Duc Trung. C. Company - Reacted to Hoa Long against an enemy force of 50 plus. Artillery and RAAF Helicopter Gunships - Provided invaluable support in and around Binh Ba and Duc Trung and Hoa Long. Armoured Units - Centurion Tanks from 1st Armoured Regiment and Armoured Personnel Carriers from 3 Cavalry Regiment, provided protection, firepower and mobility. Without their support, the battle could not have been won. It is remarkable given the battle conditions and, the strength of the enemy force that more Australians were not killed or wounded in the action. (as support) was sent to join them early afternoon on the 6th June 1969. We travelled the five kilometres from Nui Dat in APCs. As we got closer to the village we could see the damage inflicted by the Armoured units, Artillery & Helicopter gunships. 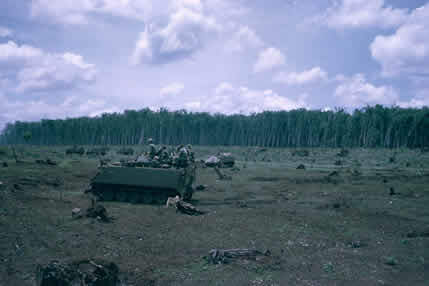 Above: B Company aboard APCs on the outskirts of Binh Ba awaits the order to move forward. The dark spot (top right) is a helicopter gunship firing into the enemy in the village. Above: Parts of the village on fire. 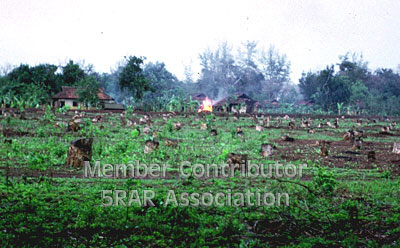 As we moved over the ground cleared of rubber trees we could see parts of the village alight. This was D Day in more ways than one. Late afternoon on the 6th, our Platoon (6 Platoon) set up a night harbour on the edge of the rubber plantation. As usual, our M60's were placed at 4, 8 and 12 o'clock and we each took our turn during the night for sentry duty of a couple of hours per two men. It was raining slightly, just enough to give yet another uncomfortable night, so I had put up my hootchie. Then, foolishly removed my boots after I'd done my turn on sentry. This was something I'd not done before and was never to do again. We had a rude awakening at daylight, when a force of NVA soldiers approached our position. Most of us were asleep (me included) when our sentry on the M60 exchanged 'waves' with the NVA. Realisation dawned and I was woken by the sound of our sentry belting out rounds on the Machine Gun and a hard kick from my 'bed mate' Peter Wardrope. Not the best time to have your boots off ... but they were ... and I returned fire with a couple of magazines from my M16. I recall the green flash from the enemy RPG's and the sound of shrapnel into the rubber trees. I have no idea how long this lasted, but long enough to be scared. I eventually dragged my boots on (laces still undone) and with other platoon members walked up to the area where we were being attacked from by the NVA. No bodies, no blood trail and as none of our platoon had been killed or wounded, assumed that the NVA like us, had all fired too high. I found this amazing, but guess that's what can happen in the heat of the moment. Later that same day, myself and another soldier were given the grisly task of burying six enemy bodies. I recall that they were Viet Cong (dressed in black) and not NVA soldiers from the early morning engagement. Later that day, 6 Platoon B Company was positioned closer to the village for a 'sweep' and I managed to take the photo of our guys just before we set off over the cleared ground with APCs. Above: B Company at the 'Forming Up Point' prior to the sweep through the village. As we prepared for this final sweep, we were told it would be with the APCs. In my ignorance, I thought that this meant we would be in single file behind the APCs for protection. But, as the photo below shows, that's not the way it's done. We spread out between the APCs and swept across maybe 100yards of open ground before entering the village. We were not fired upon. Above: 6 Platoon B Company assaulting the village in extended line. We conducted house to house clearing but I personally never found anyone alive. The damage had already been well and truly done. As we surveyed the 'mess' in the village a photographer on top of one of the Centurions asked us if we could re-enact some footage with grenades into houses etc ... we made our feelings felt! Many years later a report was broadcasted on the ABC's television programme "Nationwide" with a soldiers' claim that we had massacred women and children. This was simply not true and can only imagine that the former soldier who had made this claim was not at Binh Ba. The older men, women and kids were let out of the school house unharmed at the end of the battle. I reported the facts to Frank Cranston of the 'Canberra Times' within days of the false accusation. No enquiry was ever held as no doubt the allegations were considered to be untrue. The battle concluded on the 8 June 1969. A large enemy force had been defeated. 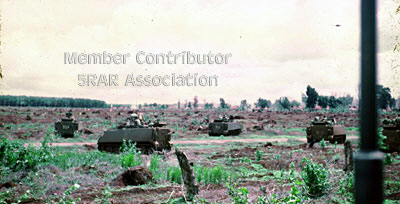 The battle for Binh Ba ranks as one of the major military victories by the Australian Task Force.